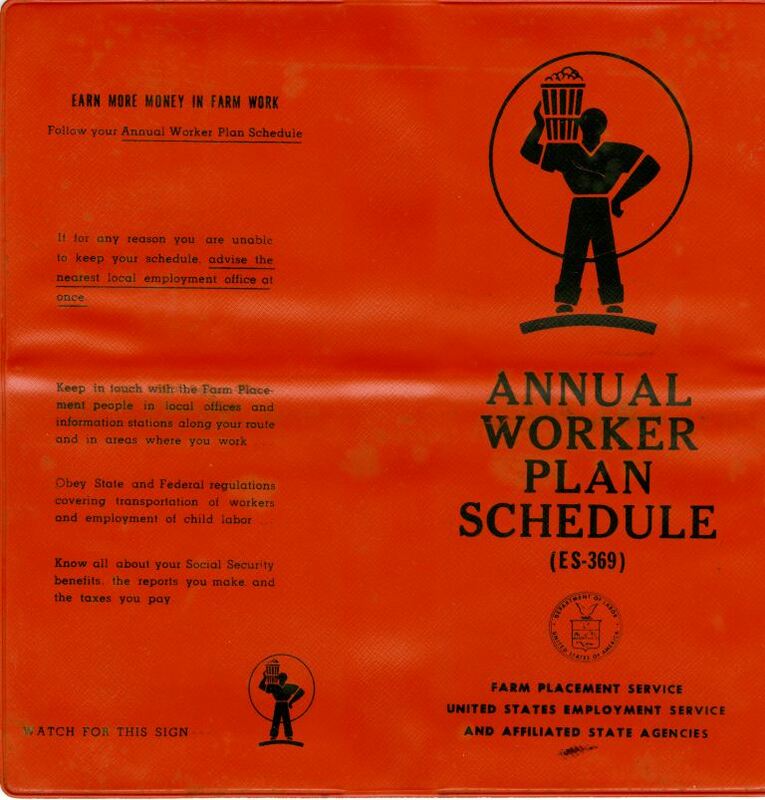 A sheath for Annual Worker Plan Schedule issued by the Farm Placement Service of the U.S. Employment Service, an agency of the U.S. Department of Labor. This sheath was owned by Pilgrim Black (1905-2002), who was born in 1905, although some records list 1907 as his birth year. Pilgrim and his wife, Lula Mae Haynes Black (1917-2007), were migrant crew leaders, and thus migrated to Wayne County in Upstate New York in the summers and back to their home in Sanford for the rest of the year. Pilgrim was the son of Harry Black (d. 1911) and Maggie Benjamin Black (ca.1870-ca.1934), who migrated to Sanford from South Carolina in the 1800s. Harry and Maggie had several children: Leckward Black, Mustar Black, Malachi Black, Leatha Black Walker (1889-1976), Pilgrim Black, Margaret Black Jones (1889-1976), and Harriett Black Lawson. In 1911, Harry owned a grocery store at 206 South Sanford Avenue. One day, he came home from work with pneumonia and passed away shortly thereafter. Pilgrim was nine years old when his father passed away. Maggie was the daughter of former slaves, Isaac and Roseanna Benjamin, and the sister of Nathan Benjamin, Pledge Benjamin, Sam Benjamin, Loui Benjamin, Chainey Benjamin, Lara Benjamin, Melvina Benjamin, and Katie Benjamin. Original red sheath: Farm Placement Service, United States Employment Service, United States Department of Labor: Private Collection of Patricia Ann Black. Digital reproduction of original red sheath: Farm Placement Service, United States Employment Service, United States Department of Labor. Originally created by the Farm Placement Service of the United States Employment Service and owned by Pilgrim Black. If for any reason you are unable to keep your schedule, advise the nearest local employment office at once. Keep in touch with the Farm Placement people in local offices and information stations along your route and in ares where you work. Obey State and Federal regulations covering transportation of workers and employment of child labor. Know all about your Social Security benefits, the reports you make and the taxes you pay. Farm Placement Service, United States Employment Service, United States Department of Labor. 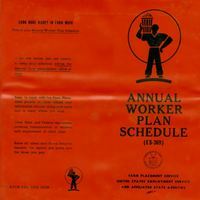 “Annual Worker Plan Schedule for Pilgrim Black.” RICHES of Central Florida accessed April 20, 2019, https://richesmi.cah.ucf.edu/omeka/items/show/2991.